No homeowner wants to be on the list kept by Code Enforcement Officers for a house deemed uninhabitable, but Crooked Tree Village does not have Code Enforcement Officers, and the house I am speaking about is the Crooked Tree Village Police Station. 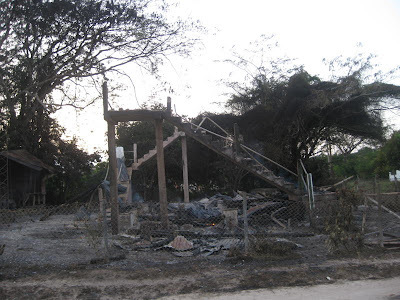 This morning the villagers of Crooked Tree woke up to a smoldering Police Station. The deplorable Police Station was burned down by unknown arsonists who fled the scene. For many years now the Crooked Tree Police Station has been literally falling down. For many years the village has been promised a new building by the government of Belize, but it remains just that, a promise. Corporal Donald Gillett, the police officer assigned to Crooked Tree Village has been conducting the business of the government from his private home. This is a huge problem; because there is no holding cell at his home to house suspects he cannot make an arrest. Instead, he has to call in the policemen from Ladyville Police Detachment, a village about twenty three miles from Crooked Tree Village. Crooked Tree Villagers have been frustrated for many years by the lack of an adequate police station, and to make matters worse, this village of about 1100 people does not even have a functioning Village Council to assist the residents in times of crisis. About five years ago, the villagers got their hopes up that the government was going to build a new police station. 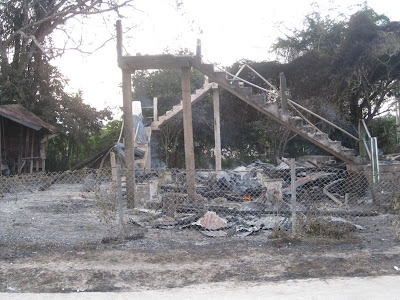 Tenders were issued for bids and up until the time of the fire no one has heard a word from the government of Belize. Successive governments have promised to address the issue, but the villagers of Crooked Tree continue to wait. 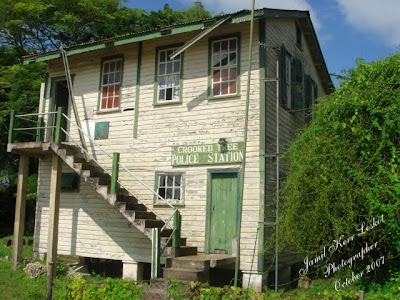 Until today, Crooked Tree Village has had one of the most dilapidated and dysfunctional police station in the country of Belize. Year after year the government of Belize promise to build a new building, and year after year nothing happens. If there is no functioning village council to work for the village and no police station, I think the only alternative for the villagers is to set up neighborhood representatives. A boarded up dilapidated government building makes the village and everything around it look horrible. In normal communities it takes one dilapidated house or building on a block to cause the others to be affected. The two storey wooden building was built in 1949 on a contract to a villager, Lee Brown. The first floor held the office and holding cell and the second floor held the living quarters for the police in residence. But for many years now, it remains an unpainted, decaying eyesore, boarded up behind a fenced yard surrounded by weeds. This is a huge problem for one of the largest villages in Belize. 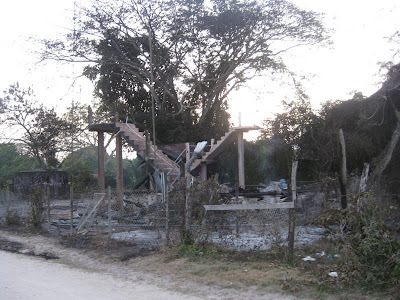 The villagers of Crooked Tree Village demand a new police station from the government of Belize!!! I think this is where the people of Crooked tree need to hold their representative responsible. When its election time they come around promising the moon and after they get elected,you don't see them anymore. I always say, quit voting for party and vote for individuals after researching their background and their history. It is such a shame that somebody feels the need to burn down such a land mark. Maybe now the government will build a new one. Thank you, Linda for keeping us up to date with the everyday happenings of our village. Wow...That building has been there since i was in a lil girl...& i can remember it looking ragged n beat down then. Well maybe someone burnt it down so they (Belize) have no other choice but to do something about it! I remember when I was small and going to school the Police Station was very impressive looking to me. I can remembered the white station trim with green and the pretty sign in front. I can also remembered the reddish brown stable that Mr. Reggie used to stable the horse that they used then. I don't know if it was because I was young but the station and the horse had looked beautiful to me and when Mr. Reggie was on that horse he sat straight up. I hope they don't waste time trying to find the culprit. You know the saying that a picture is worth a thousand words well the before pictures tells us how terrible that building looked. Maybe one of the things we can push for is for when they build the new station they use some of the same architecture. What you think about that? I am a resident of Crooked Tree Village,and it is so shameful to know that people have the need to take matters into their own hands. We the people of this wonderful village demand better treatment from the government of Belize. In Belize, the people of the government never try to help the poor villages. WHY? The answer is very simple, they use the resources of the government for their personal gain. Come on people we are not up in the clouds!! We have rights to go out and do something about it. We the people of Crooked Tree demand a new police station for our village. Stop putting money in your pockets and start doing something for a village that have been ignored for all my life. Love this story that my uncle edmond castro an cousin james dawson well guess we have to get a new station now. Hi Florence, thanks for visiting Village View Post. With the burning of the police station, this is now an unstoppable train. I will not stop at you uncle or cousin, I will now take the case of CT directly to Belmopan, to the minister in charge of National Security, Minister Perdomo. This deplorable condition of CT was before the time of your uncle. Thanks again and much love!! Its a sad thing to say but I have to applaud whoever burnt down that Eyesore!! It is a complete and utter shame that the villagers have had to endure the disgrace a 'building' like that has caused. Crooked Tree is a village that has continued to attract many tourist and to think that this is one of the MAIN things that they have had to see..............it's just appalling. I do hope some good will come of this and the "minister" steps up to do HIS JOB!! !